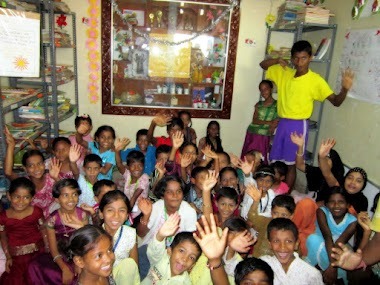 Stylus India as part of their CSR initiative coordinated with Toybank for a toy collection and distribution activity. The Stylus Team put in humongous efforts in collecting toys, wrapping them artistically in newspapers and tracking the age-grouped toy inventory adhering to normal norms of toy selections. Stylus Team were spot on in communication and kept Toybank informed and well updated throughout this drive. The Toy Distribution was held at MakkalaJagriti – a library/play centre/recreation zone for kids between 6-14 living in and around a modest Old Guddadhalli area adjacent to Mysore Road aloof from the razzmatazz of bourgeoisie Bangalore . Stylus Team managed to reach the venue on time even after last minute change of routes due to haphazard Bangalore Traffic, thus making a beeline of uniformed harbingers of joy with cartons of myriad toys in their hands towards the two storeys Makkala Jagriti centre. Toybank volunteers were present at venue beforehand and welcomed the bubbly enthusiastic Stylus Volunteers for many of whom this seemed the maiden endeavor. Initially the Stylus volunteers far outnumbered the kids present at centre but slowly the young smiles grew abundant. With space constraint being imminent the planned activities had to be shelved a point which is on our priority list to ensure smoothness of flow of events in future. 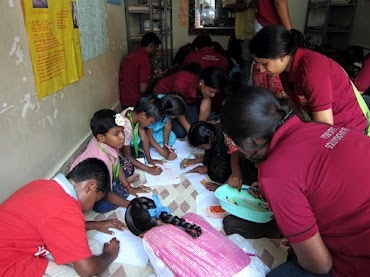 But there was still enough space to let the kids unleash their creativity on white canvas. Stylus volunteers armed with thin white papers and motley collection of sketch pens urged the young kids to paint their expressions. The alliance between kids and volunteers was pretty unshakable by now, so naturally it was time to move away from art part to something which would turn up the decibels. The kids mixed up with volunteers to form two mixed groups for a game of Dumb-Charades. First hurdle was identifying animal names. Good to find many fans of Animal Planet as kids knew the animal roars and actions thoroughly. Next obstacle was places which to everyone’s surprise both groups managed to guess without much brainstorming. The definitive entity was a public favorite – films - which resulted in enactment of some famous actions, famous scenes and even a dance. Overall nothing less than a laugh riot . The toy distribution part was held simultaneously at the ground floor of the venue with kids collecting their surprise as per age groups and posing for the shutterbugs amongst the volunteers – every kid feeling a celeb, an innocent one for a change, in one way or other. The little ones showed tremendous mutual respect as no one eyed the toys of others – a rare quality in this fierce world to which we hope the kids cling on to for a better tomorrow.A really nice bunch of kids with good values as there were absolutely zero complaints about the sizes of toys received too. We at Toybank would like to thank Ranjini and Shanthi – the coordinators/enforcers/teachers of Makkala Jagriti and the Stylus Volunteers for amazing participation in this activity to make it a wonderful experience to kids. Special thanks to Arif who engages on continuous basis with Makkala Jagriti and for lending unexpected helping hand during this event. The zeal and vibrancy of the Byes exchanged between all the volunteers and the kids proclaimed the event as a grand success!